Once a web game, now an Early Access game on Steam, Lino Slahuschek's Ratz Instagib is just delightful. It's the game I've played the most so far this year, and I really can't stop. Some are going to hate it, primarily because the inexperienced often struggle against strong opponents at first (as I did and still do), but I love it. 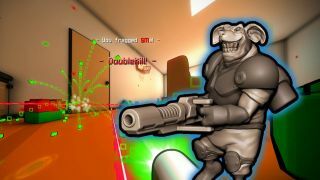 Not only does Ratz bring back great memories of Quake II railgun battles and Unreal Tournament's instagib mode, it has its own merits—primarily the level of customization which creates a very level playing field, and a CTF mode I've heard is great (though I haven't made it into a CTF match just yet, as there aren't quite enough players). Watch a few of my recent rounds above for more on why I'm obsessed with this strange war between rats.